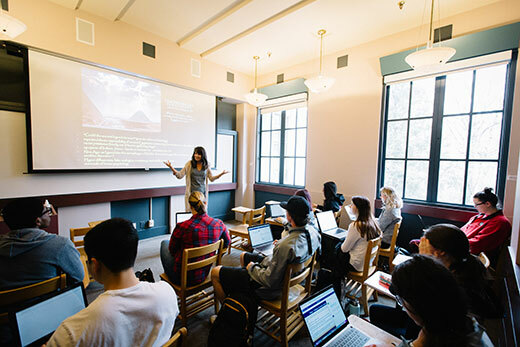 In “Archaeology: Modern Myths, Pseudo-Science and the Study of the Past,” classics professor Sandra Blakely’s students learn analytical skills that can help them evaluate not only archaeological theories, but also today’s "fake news." With just seconds left before Sandra Blakely’s class ends for the week, she and several Emory College undergraduates remain locked in a lively discussion. That may help explain the near-constant classroom feedback and questions. It also may be why the terms “ridiculous” and “wackadoo” pepper the conversation on today’s final topic: the repeatedly debunked yet oddly enduring idea that Vikings paddled their way inland to settle in Minnesota centuries before Columbus set sail from Spain. As a discipline, archaeology bridges narrative and material evidence. The goal is to uncover the story of human culture through objects that can be held in the hand, viewed in the field and analyzed in the lab. Such work naturally inspires stories. Blakely sees the analytical tools needed in the field as valuable skills that work not only with artifacts but in making sense of present-day “fake news” narratives — and even the concept of American identity. “Science reveals stories that are invisible to the naked eye, but that does not exhaust the appetite for wonder and mythopoeic impulse,” Blakely says. Archaeological investigation is inherently interdisciplinary, relying on resources from historical texts to isotopic analyses. Blakely’s course teaches the field’s analytical tools by having students hone their research skills and creative thinking through applying a critical eye to the narratives that they encounter. Often, the fallacies can be spotted immediately. Much as Columbus “discovered” North America, for instance, early archaeological researchers in South and Central America talked of pristine lands, never before seen. Indigenous communities flourished, of course, in all of those places. Yet their voices are absent from stories of “lost cities” — an absence which gives those tales more in common with the myth of Atlantis than with the history revealed in artifacts and landscape studies. As a creative writing major, first-year student Leigh Pirch finds the stories themselves fascinating, especially when understanding the reasons why falsehoods like the Viking relics endure. It makes sense that 19th century Scandinavian immigrants — viewed with contempt as illiterate — would latch onto the idea of a noble history, she says. Still, the reasons that people invent and share such stories can be used not only to influence how we think about the past, but also how we think about our world today. The Viking myth that started as a harmless narrative to build community has more recently become a rallying point for a particularly violent strain of white nationalists. The ability to engage with larger questions about history and the evolution of ideologies has some students wanting to revisit their own experiences. A first-year student considering a film studies major, Murphy Powell has long loved movies such as “National Treasure” for their ability to string together what she thought were ridiculous conspiracies into entertainment. She has since watched how that movie, and some of the better-known myths, use facts to help bolster their falsehoods. Small details, she says, can make big stories seem more believable. For Faass, being able to break down over-the-top claims of aliens by spotting the unfounded inferences also helps make it easier to see the red flags in the less dramatic tales in class, and in the real world.